The 3D facial reconstruction of Saint Valentine, the patron saint of lovers! 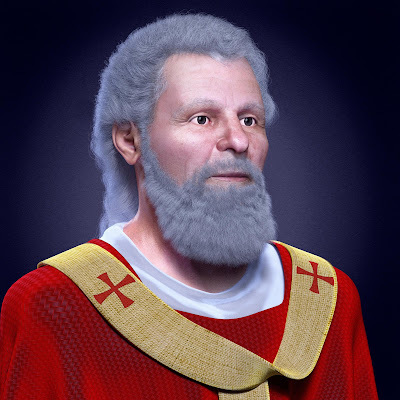 Follow the details about the facial reconstruction of Saint Valentine, the patron saint of lovers who had his face revealed and whose news was published in 32 languages! I met Dr. José Luís Lira, still in 2014, on the occasion of the presentation of St. Anthony's face. As a hagiologist, a specialist in the life of the Saints, he introduced me to a series of relics around the world that could be reconstructed. 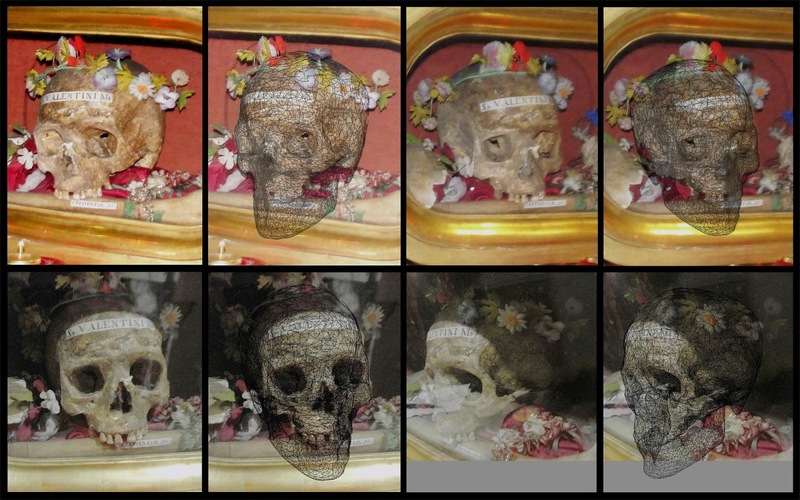 The first result of our partnership was the reconstruction of the face of St. Mary Magdalene in 2015, made from her supposed skull, present in the Basilica that bears the name of the saint in the French city of Saint-Maximin-la- Sainte-Baume. Months later, almost at the end of the year, we present another result, the facial reconstruction of Santa Paulina. The reconstrucion was news in 32 languages. See the details here. Dr. Lira has always had free transit among religious, even because he studied in a seminary to be a priest, although after he left it, graduated and built his professional career in the legal area (academically is a university professor, Ph.D. in Law from the Università degli Studi di Messina, Italy). In addition to the connection with the Catholic Church, he published several books on saints and also belongs to the Equestrian Order of the Holy Sepulcher of Jerusalem, whose origins date back to the First Crusade when its leader, Godfrey of Bouillon, freed Jerusalem. It is currently an International Public Association of believers, with canonical and public juridical personality, constituted by the Holy See and the Holy Father is responsible for the Order (Source: Site of the order). 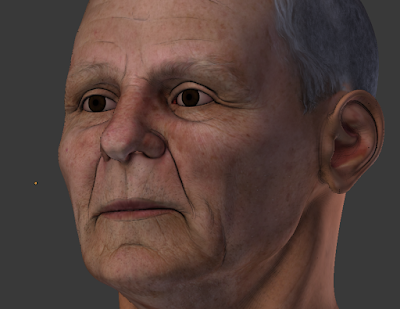 To this day I had worked with the facial reconstruction of seven saints (Anthony of Padua, Mary Magdelene, Saint Sidoine of Aix, Rose of Lima, Martin of Porres, Jhon Macías, and Paulina Visintainer) and two beats (Luca Belludi and Ana de los Ángeles Monteagudo). From the beginning of our partnership we plan to write a book about these works, treating both sides of the coin, the technical and the religious. On the occasion of the reconstruction of the face of St. Mary Magdalene we had the opportunity to exercise our aspirations, as we wrote and published a book about the works with the saint. We came in contact with a number of relic-bearing churches in order to rebuild the face of all of them. However, contacting via the internet has not always proved to be a very effective option, either because of the high number of e-mails ignored, the only “OK” after many attempts (Mary Magdelene) or the categorical "no". Among the series of unanswered emails was the one sent to the Basilica of Santa Maria in Cosmedin, located in Rome, Italy. 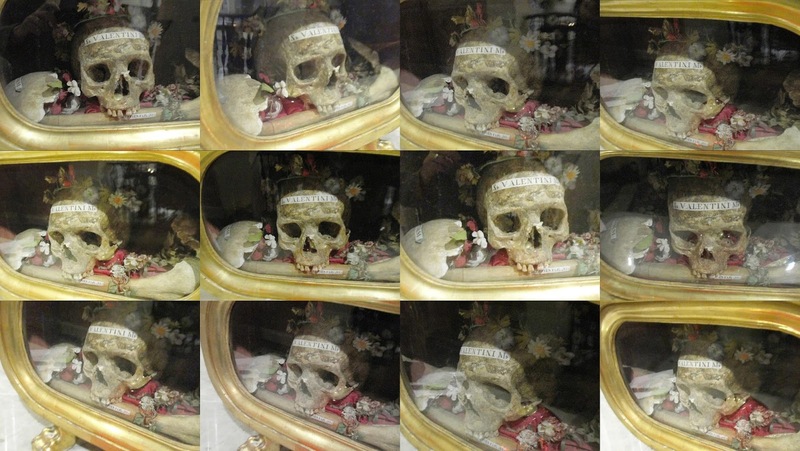 According to our studies, in that church there was a skull belonging to St. Valentine Martyr. "However, the whole saga of the martyr is uncertain. There are at least three religious under the name of Valentine, two of them buried in Rome and a third who would have been killed in Africa. The Catholic Church itself, in 1969, stop celebrating the saint's birthday by considering its origins - and even its existence - uncertain." In our research the only skull that appears is precisely this, one of the three mentioned in the text and one of the two that have the buried bodies in Rome. Important information: When searching for "St Valentine skull" in Google image, the results returned only show the skull used in this reconstruction work. 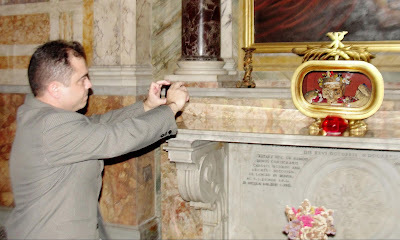 When traveling to that city, during the canonization of Blessed José Sánchez del Río, Dr. Lira decided to visit the basilica where the remains of the saint (Valentine) were located. Perhaps, conversing personally with those responsible for the guard, the chance to rebuild the face was greater. As he related, on the thirteenth, he thought of going to Venice, but at dawn he had severe pains and cramp in his right leg, he decided to stay in Rome, because, besides everything, it was raining. Staying very close to the Vatican, he went to St. Peter's Square to see the preparation for the canonization and thinking he could go "in search" of St. Valentine. After lunch in the vicinity of San Pedro, he returned to the Square and to surprise, a lady who sold holy images offered him one of Saint Valentine, with the same image that is stained glass of the Basilica of Terni. Excited, he decided to go to the basilica where the saint's relic was. 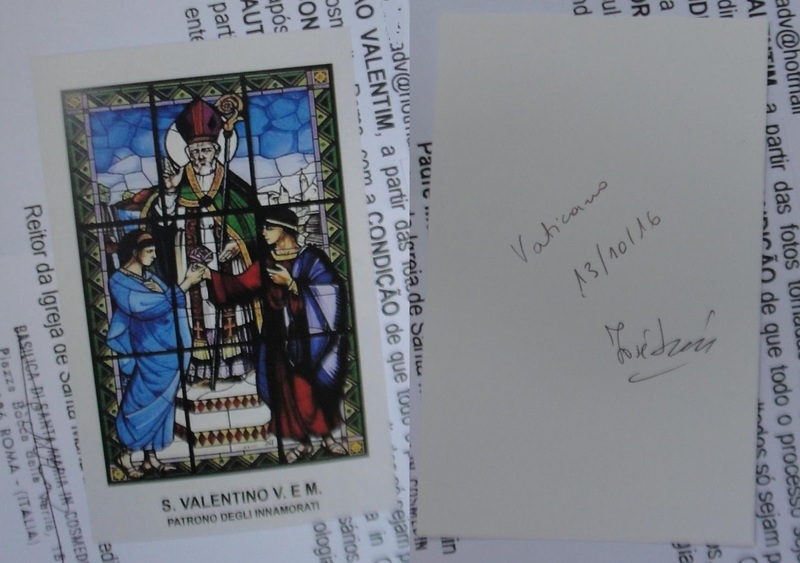 On arriving at the Church on October 13, 2016, Dr. José Luís Lira first walked around the Church, took some photos and in the sacristy explained to the secretary of the Rector of the Basilica the reasons for the visit and, after waiting, Was attended by Fr. Mtanious Hadad, the Rector himself. After a meeting, it was agreed that the hagiologist would come back the other day, the 14th, to take pictures of the skull at 11 am. 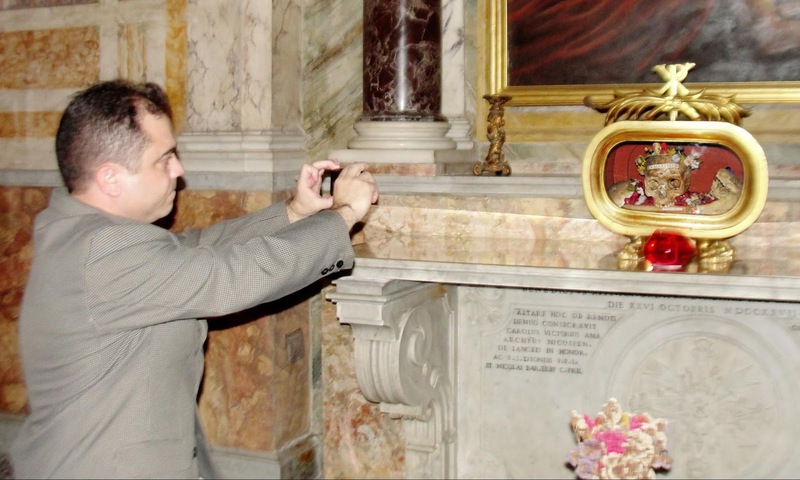 At 11 o'clock on the morning of October 14, 2016, Dr. José Luís Lira had access to the altar where the relic of Saint Valentine is found and spent about 40 minutes photographing it. So that the photos could be made with tranquility the main door of the Basilica was closed, following the determination of the Father Hadad, nevertheless, the faithful could have access by the other entrances. Some even photographed him doing the work. An interesting fact about Dr. Lira's participation in data collection is that he had never done this before. The photographs are usually taken by a person trained in the technique and to prevent something from going wrong he proceeded with the works doing 251 photos of the reliquary! 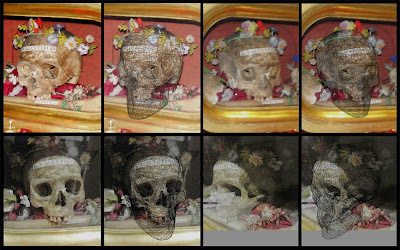 From these images were selected 35 for the digitization of the skull and 9 for the reconstruction of the reliquary, which served as a reference scale, since its measurements were taken by Dr. Lira at the time of the photographs. 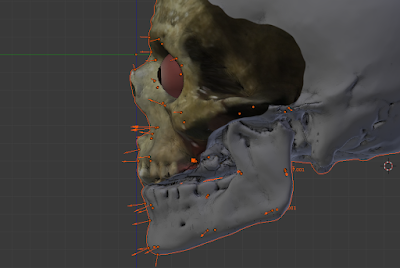 This phase of the work was developed by me and includes everything from the scanning of the skull to digital facial reconstruction. 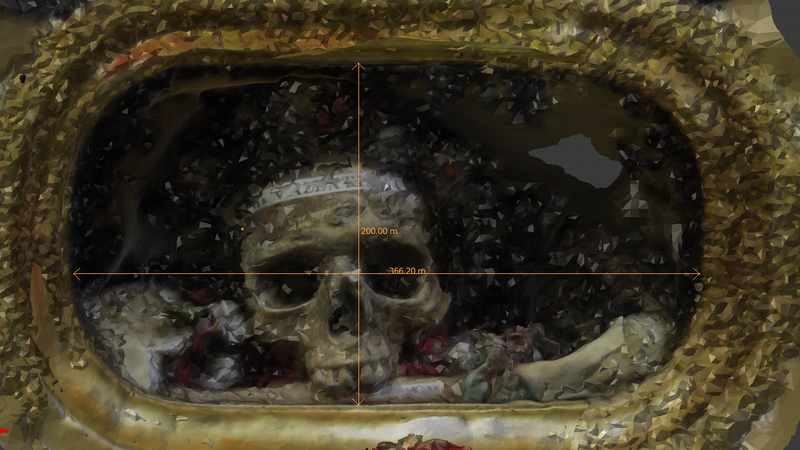 Two scans were required, one focused on skull scanning and another scanning the reliquary structure, which would serve as a reference for scale, since the forogrammetry technique does not automatically resize the objects. The dimensions of the area with the glass were of 20x36 cm, according to the measurements of Dr. Lira. 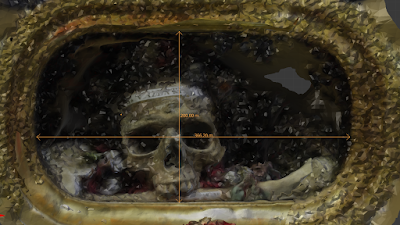 To scan the skull the system used was the Recap360 from Autodesk® and to scan the reliquary was chosen by Agisoft® Photoscan©. The positioning of the cameras in 3D was achieved through the PPT-GUI software. In order to continue with the work of recovering the missing parts of the skull, the initial files of the scan were sent to the IML expert from Rio de Janeiro, Dr. Marcos Paulo Salles Machado, who analyzed the material and inferred that was a male. 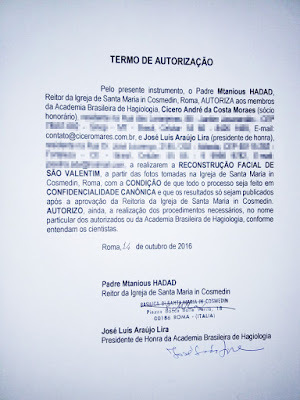 It is important to note that Dr. Machado received the files with the text "Valentine" hidden, and without any preliminary information about the skull, so that the analysis was done blindly. 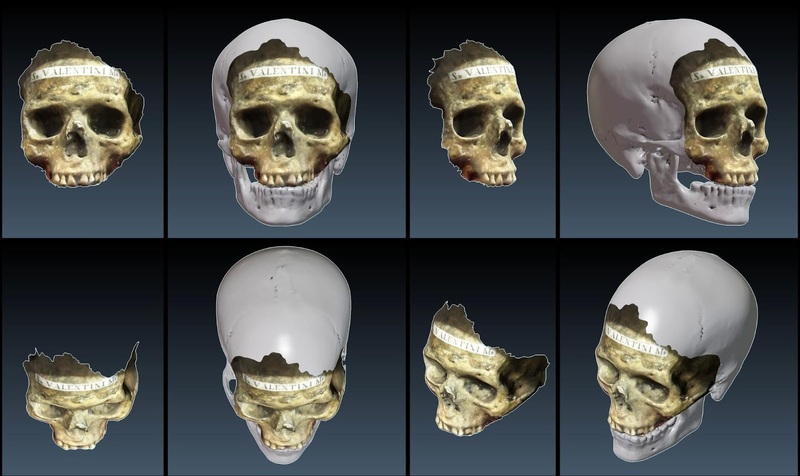 The 3D scanning algorithm, though very good, was able to reconstruct only one region of the skull. Partly because the camera used was in automatic mode and did not balance the illumination very well and partly because the skull was packed in a reliquary that significantly limits the scanning of the entire surface by the photos. 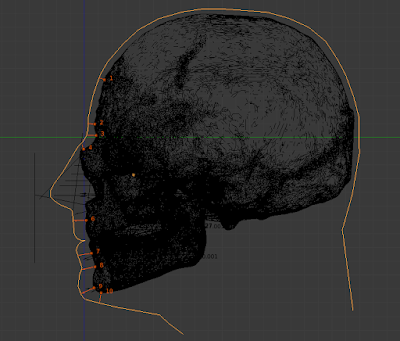 To recover the missing part, I used a skull from my 3D digital collection. The piece was chosen with the most compatible form the anatomy of the relic. Some adaptations have proved necessary until the "digital remnant" is coupled. It was necessary to exclude, in the other skull, the region that coincides with the remainder so that the model was unified in only one object. A fim de recuperar as partes faltantes respeitando o volume real do crânio, as referências das câmeras virtuais, posicionadas através do PPT-GUI, foram usadas nas 9 fotos mais distantes e nas 35 fotos mais próximas. Com esta característica a anatomia foi reconstruída com pequenas intervenções manuais, recuperando a região que não foi automaticamente digitalizada pelo processo de fotogrametria. 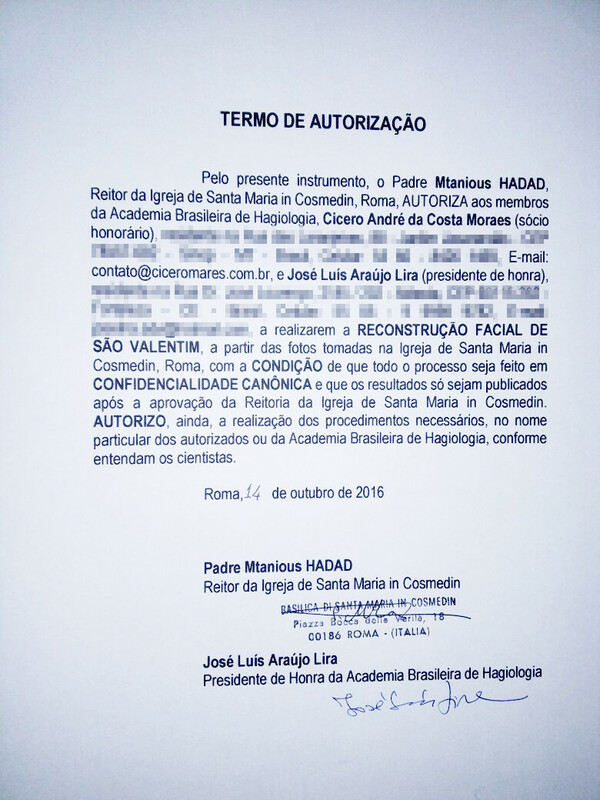 Com os dados do gênero (masculino), ancestrais (europeu) e faixa etária (+ 55) fornecidos pelo Dr. Marcos Paulo Salles Machado, pude iniciar a reconstrução facial 3D. 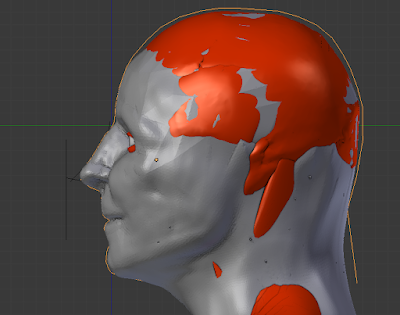 Before any modeling work, it is necessary to place the soft tissue thickness markers. 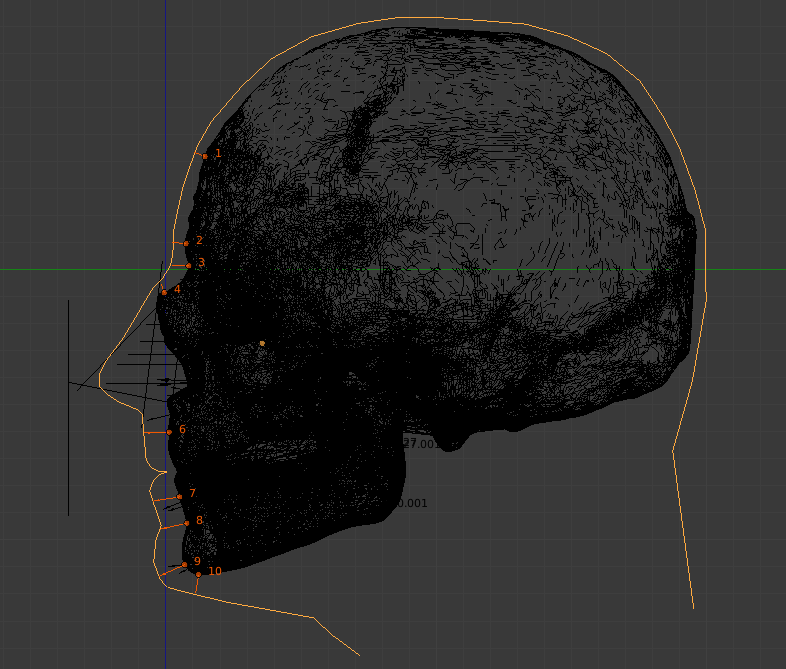 These are pins with different heights at different points of the skull. These heights correspond to the thickness of the soft tissue (skin, muscles, etc.) at the points where they were fixed, based on a mean raised from a population mean, in this case, we chose data acquired in the measurement of hundreds of individuals Male, with European ancestry and over 55 years old. 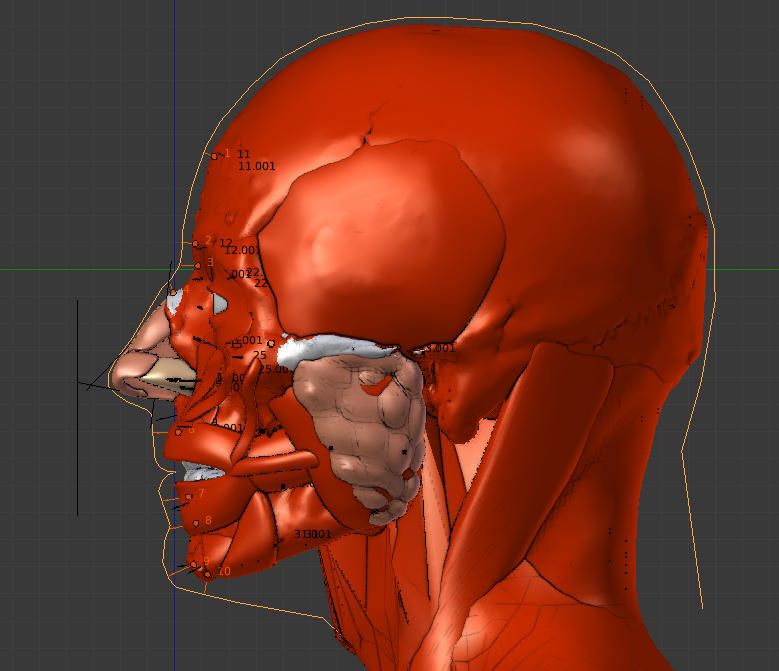 More details about this process can be found in the free ebook "Digital Facial 3D Reconstruction" (in Portuguese) through this link. When tracing a line within the limits of the soft tissue thickness markers, and respecting the nasal projection, we have a basic outline of the face profile. The main facial muscles are then modeled to aid in reconstruction with an anatomical parameter. 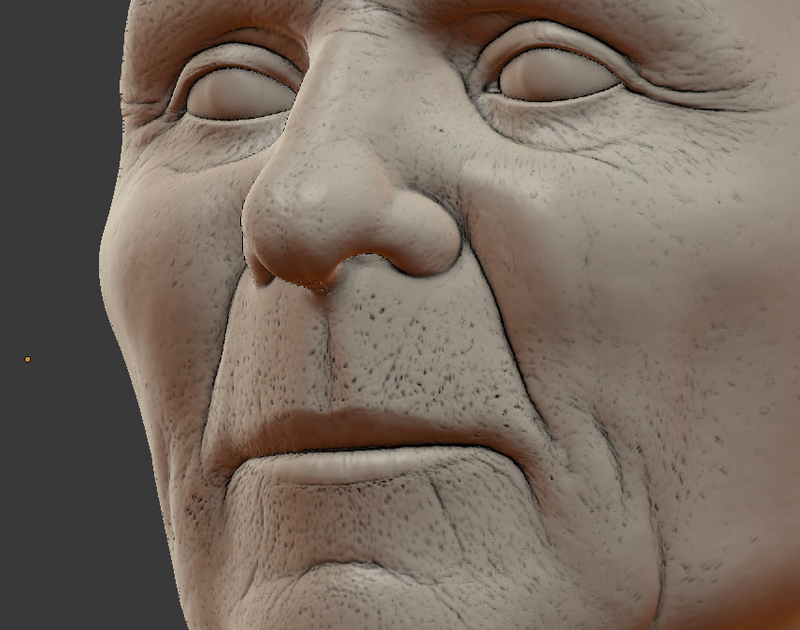 Once the muscles are set up, the next step is to proceed with a low-resolution digital sculpture, so as to shape a base of the face, using as reference the muscles and especially the soft tissue thickness markers. The basic sculpture is finished when the markers are all hidden by the mass corresponding to the soft tissue. 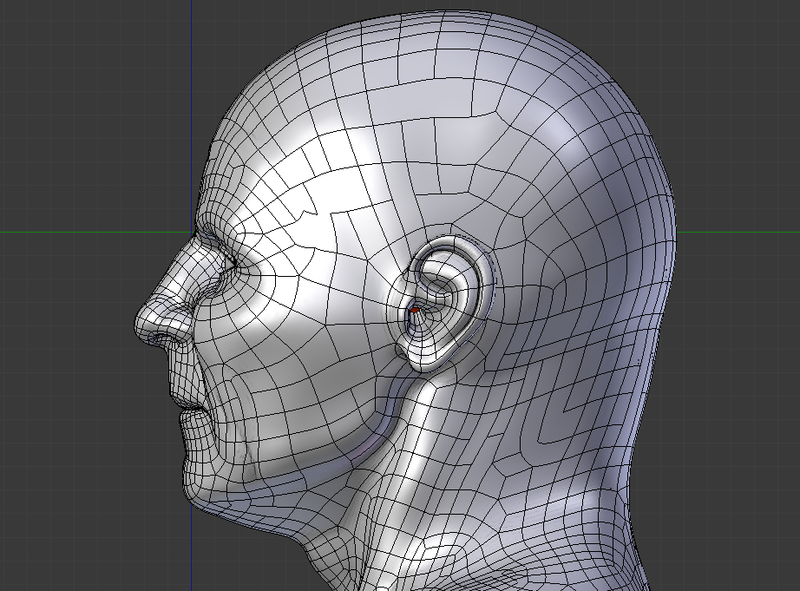 The region of the face undergoes a process called retopo, where a more organized 3D mesh involves the base sculpture and receives more data, such as the ears and muscles. The 3D mesh is pigmented by projection of mapping and digital painting, to give the colors of the face. The next step is to implant hair and the beard digitally, in order to finalize the composition of the face, according to the age group. Finally the reconstruction is finished, with the placement of the clothing. 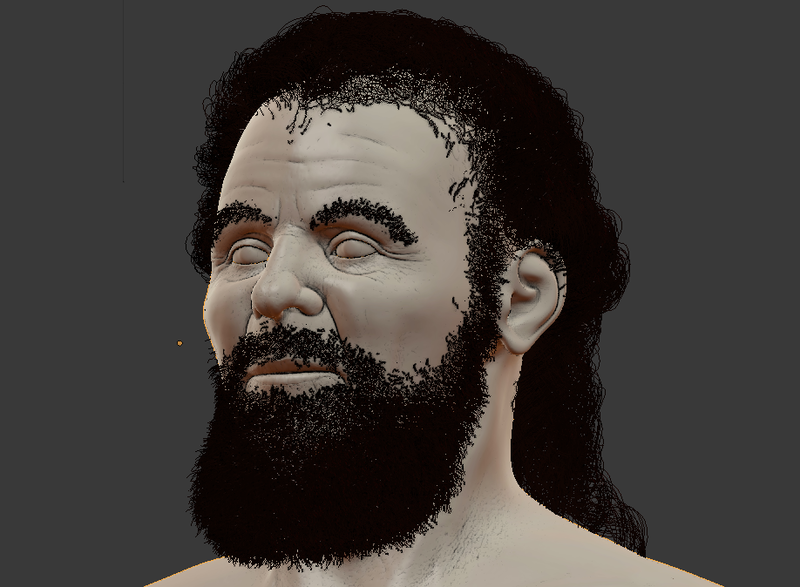 The properly pigmented, dressed and haired model is then finalized. It goes through a process called rendering, which provides light, shade and more quality to the image. According to remarks on the clothing punctuated by Dr. Lira, St. Valentine uses the pallium of current use of the cardinals and archbishop, since it was common at the time being larger than the current. The image is in a tunic, an official liturgical vestment of every priest during the celebrations he presides over. The tunic is a white robe and hides the individuality of the priest, so that the Christ presiding over the Sacrifice can be perceived in him. The tunic reminds us that the priest who, before being ordained was baptized with Christ, now symbolically covers the new man (to preside over the Eucharistic Sacrifice). Because it is a holy martyr, it was decided to use the red color for a kind of chasuble, a solemn vestment proper to the priest (deacon can not use it), which has no seam on the sides and is used in Sunday Masses and days Holidays. Martyrdom is the most primitive form of recognition of the sanctity of a Christian, and therefore a reason for celebration, so we chose this dress, defined by the expert who knows the subject. 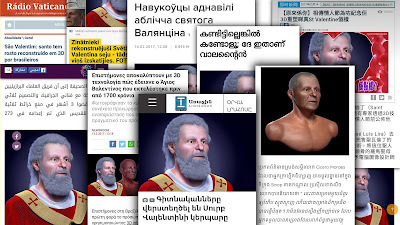 An infographic is generated so that the interested ones can understand how the work was developed and sent to the Father Mtanious Hadad, who gave authorization for the facial reconstruction, for its appreciation. The reporter Janet Tappin Coelho, like other opportunities, was chosen by the team to write exclusively on the process of facial reconstruction of the Saint. On February 13, 2017 the first report was published on the website of the British newspaper Daily Mirror and on the 14th in the The Mirror. Quickly the news won the world being replicated, so far, in 32 languages! 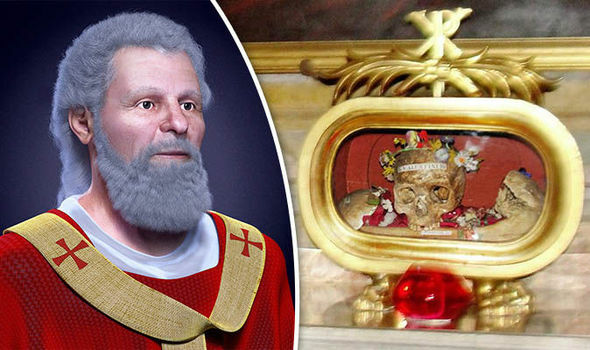 Coincidentally the facial reconstruction was finalized on January 14, exact three months after the start of the project and a month before the feast of the Holy Patron Saint Valentine. For all who participated in this endeavor the result was fantastic. 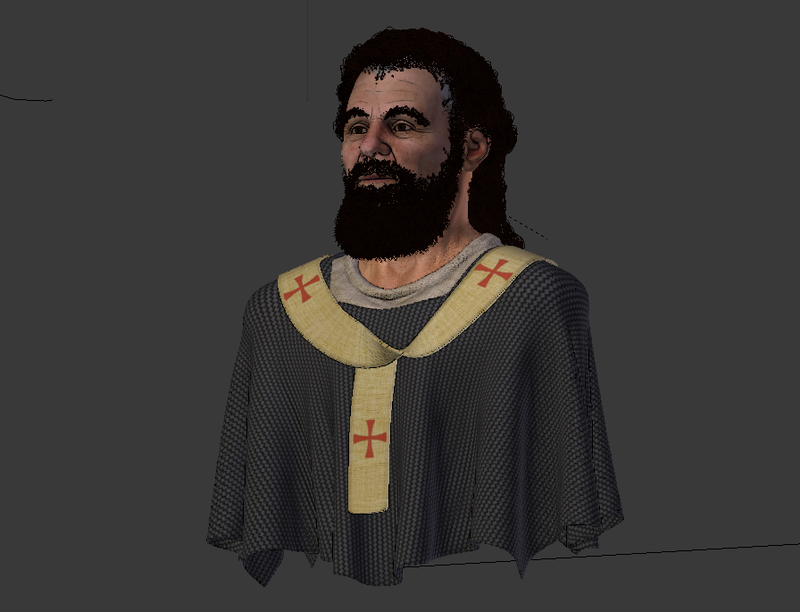 This is the tenth Catholic figure we had the honor of rebuilding and now we have a good basis to continue with the project, both in our written work and in the sequence of this job, whose next steps are the 3D impression of the bust (CTI Renato Archer) and later the painting done by the artist Mari Bueno.